Junior Coders-Ozobots, Programming & Art Grades 4-7 New Camp!! A perfect combination of Ozobots, Art and Beginning Scratch (Developed by MIT) to introduce coding and game design. Kids will need and use these skills in the 21st Century and have fun learning and making their own working animations, designs and games! The perfect mix of cutting-edge technology to engage kids! Learn, design and experiment with code and art! Gain knowledge in coding fundamentals and then rapidly proceed to using that knowledge with confidence while creating your own robots, games and animations. This course is aimed at entry-level coders grades 4-7. 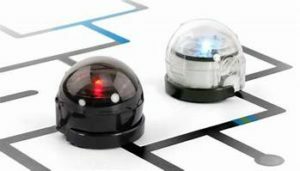 Learn about control and sensors while programming the mini robot, the Ozobot. Become a digital artist, creating your own characters, gifs and animations. Design, create and share your new games. Learn about graphical / block coding. In this hands-on camp, students grades 4-7, will learn to code and create games with Ozobot robotics. They’ll explore programming the Evo robot with block coding, from completing simple commands right through to creating a dance game. They’ll also learn how robotics are used in the 21st century and be inspired with how they can be involved.